There are parties, and then there are parties. The first is with children and birthday cake. The latter is with booze and artists. This one will be the good one. The latter one. A real, actual, Middlecott Sketchbattle Championship right in the Jalopnik Blog Bunker itself. And we want you – yes, YOU, of all the people in the world – to be there. With the New York Auto Show coming up soon, and us living in this godforsaken decrepitude known as “New York,” we felt like it was time for a little celebration. A celebration of the cars, of art, of design and engineering and imagination and all the awesome things that come with that. A Sketchbattle. In New York. For the first time ever. 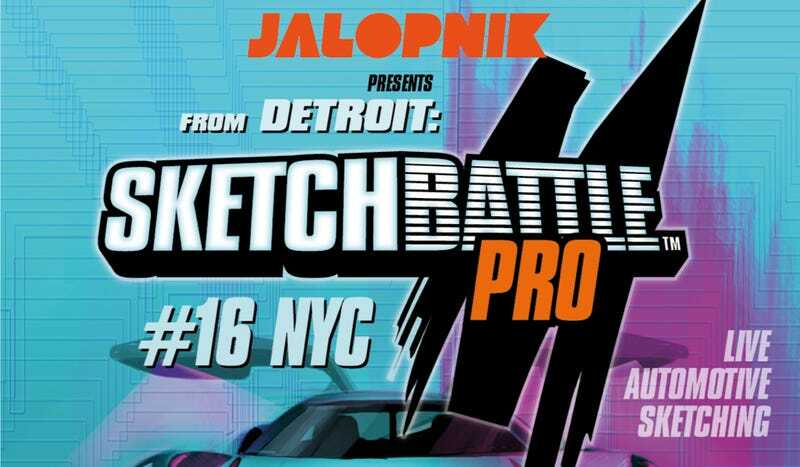 But just because it’s in Jalopnik HQ, doesn’t mean it still isn’t a big charity gala where up-and-coming designers flex their artistic muscles in front of a live audience, where at the end of the night the best of the best take home a cash prize. Middlecott Design, our partner for the event, is going to make sure all of that happens, but first we need one thing. We need you. Spectators. Party-goers. People who like drinking alcohol and meeting the good car people and watching the greatest competition in all of automotive design and doing it all for a good cause. Today, BPI enrolls over 300 incarcerated students full-time in programs that culminate in degrees from Bard College; it offers extensive support for its alumni in and around New York City; and, it has developed a nationwide network of leading universities and colleges to catalyze a transformation in the relationship between education and criminal justice in the United States. As BPI notes, 97.5 percent of its graduates who leave prison never go back to prison. So all of this isn’t just to make ourselves feel good, it actually makes a real, tangible difference in people’s lives. Cars, art, booze, and a good cause doesn’t make for a bad party at all. Oh, and Jason Torchinsky. Yes, he’ll be there too. Can’t have an art contest without Jalopnik’s Senior Art Captain judging it all, naturally. When: Wednesday, April 17, 2019 at 7 p.m. Even if you’re a weirdo who hates cars and fun and, let’s face it, blogs, you can always count on Jalopnik to have a good time. If you’re in town for the show, or if you live here, or if you’re just passing through, or hell, you want to just go for a drive (something we highly recommend), stop on by. It’ll be cool, I promise.